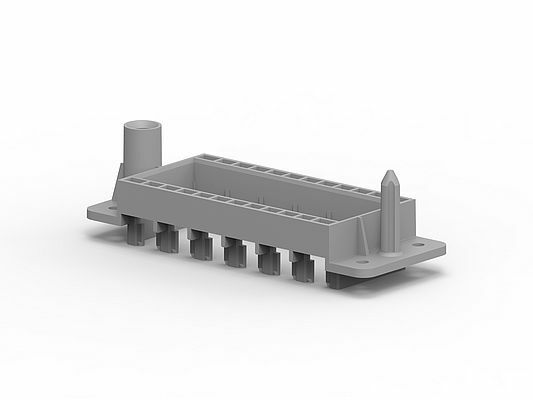 TE Connectivity is launching the HDC Thermoplastic Docking Frame for the company’s HMN series of heavy duty connector (HDC) inserts. It enables blind mating of the inserts in drawers, allowing the connectors to guide themselves into the correct mating positions in environments where direct visibility or access is limited. No tools are needed to unlock the modules either. Applications include motor control centers, medium voltage switchgear, and power rack systems in such areas as energy storage. TE’s HMN series is a new system of HDC inserts designed to meet the specific requirements of individual customers. Individual modules now allow the integration of electrical, optical and gaseous signal and power connections in one connector assembly. The basic modules snap into a mounting frame and can be exchanged separately at any time. The HDC Thermoplastic Docking Frame increases design flexibility and reduces the complexity of connection systems as well as the number of different parts that need to be used, by accepting standard modules from the HMN series. TE’s HDC Thermoplastic Docking Frame also protects the inserts from damage through vibrations and mechanical shocks. Pre-leading pins and floating washers in the HDC balance the mechanical tolerances of the drawer system (floating tolerance, ± 2 mm; compensating system tolerance, ± 4mm). The frame can be fixed in the plate using standard M4 screws, without hoods or housings. All these features make it more cost-efficient than metal versions. The HDC Thermoplastic Docking Frame is available in four different sizes that accept two, three, four or six single modules. It is injection molded in robust polycarbonate with a UL94 V-0 flammability rating.